How does your business know that the ABNs that were provided years ago were, and still are, the correct ones? Or that the GST status of your payee is up to date? 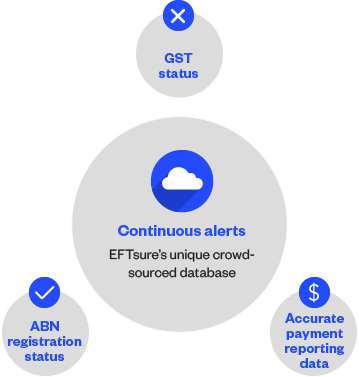 The COMPLYsure component of EFTsure allows your organisation to constantly monitor critical information that assists you with new ATO legislation - Taxable Payments Reporting System (TPRS), auditing and other compliance commitments. If you are in an sector that is highly regulated and where auditing and compliance is an important part of what your accounts department does, then accurate, eﬃcient and eﬀective payment reporting data is crucial.